NEW ENGLAND FUTSAL, the largest provider of Futsal training in the USA is pleased to partner with Swansea/Somerset Youth Soccer to bring the best FUTSAL/SOCCER training to the children of Swansea/Somerset, Fairhaven, Dartomouth, Westport, Fall River, Briston, and surrounding towns.! The concept is very simple: BETTER SKILLS = HIGHER SELF-ESTEEM = BETTER SOCCER PLAYER! Our Futsal Methodology is comprised of cognitive small sided games while focusing on individual and team play. As a result, players become much better, very fast! Join our international staff of licensed Futsal coaches and EXPERIENCE TRANSFORMATION IN YOUR SOCCER GAME! The best soccer players around the world developed their skills at an exponential rate using this FUTSAL TRAINING METHODOLOGY SYSTEM. RONALDO, NEYMAR, MESSI, INIESTA, RYAN GIGGS as well as legends like PELE, MARADONA, and ZIDANE, to name a few, ALL PLAYED FUTSAL! Follow the example of the Spanish National Team and the Brazilian Olympic Gold Medalist team where almost all players used FUTSAL to become the best they can be! 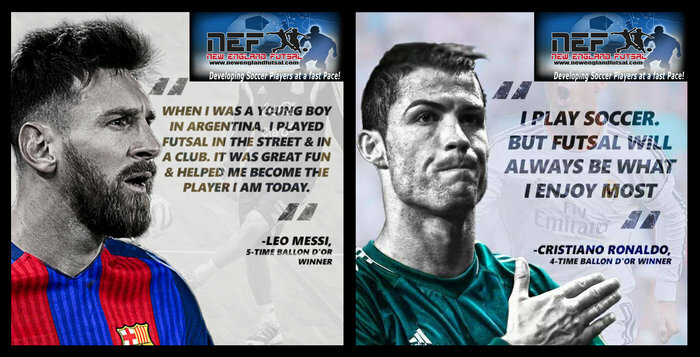 EXPOSE YOUR CHILD TO FUTSAL AND EXPECT TRANSFORMATION! REGISTER NOW! SPACE IS VERY, VERY LIMITED!! INVESTMENT: $50 - SSYSL PLAYERS - $65 - ALL OTHERS. 4 WEEKS OF THE BEST TRAINING YOUR CHILD WILL EVER GET! Space is limited and filled on a first-come, first-serve basis. Baden FUTSAL BALLS WILL BE AVAILABLE for purchase at first class for $25 each.